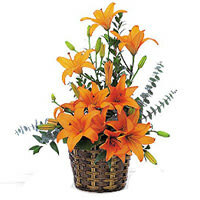 Sweeten your relationships by sending this Visually Tender Love Bouquet Of Lilies to your close ones who deserve your love. Exotic Lilies Arrangement (Available only in Major Cities) and Assorted Cadburys Chocolate. Exotic Lilies Arrangement (Available only in Major Cities) with 500 grms Assorted Sweets. Exotic Lilies Arrangement (Available only in Major Cities) with 16 pcs Ferrero Rocher chocolate box.